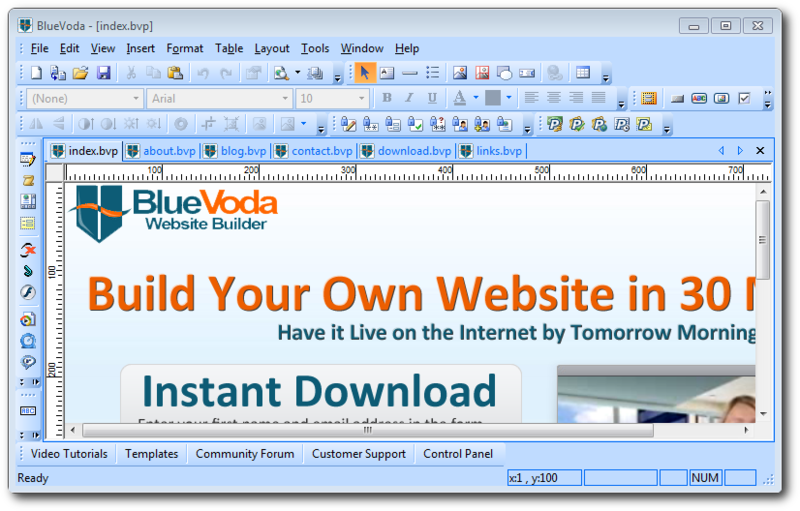 The arrival of the BlueVoda website builder 12.2 marks the greatest and most powerful BlueVoda release ever! Whatever your background, whatever your training, dozens of new BlueVoda features and countless improvements conspire to bolster the BlueVoda mission statement; to provide everyone, everywhere with all the tools needed to successfully build a fantastic website and get it live on the Internet by tomorrow morning! In the eyes of the aspiring novice website builder, website design often appears to be very difficult. It is a technical venture, reliant on precise technologies that few understand fully or have mastery over. This can make the building of your website very costly. Traditionally website building combines creativity with technical expertise with minds-eye creativity. That’s has all changed with the development of the BlueVoda website builder and now BlueVoda 12.2 means the end of heartache for aspiring web designers around the globe. BlueVoda doesn’t require the designer to write a single line of HTML or CSS code or even have a passing knowledge of the hypertext-transfer protocol. It provides the user a blank workspace to fill as their creativity sees necessary. All elements are added with a single click and then edited and positioned easily. BlueVoda aims to be the beginning of a complete, easy and hands-on website building experience. BlueVoda 12.2 will empower millions of aspiring website builders to get their website up, live on the Internet and they’ll be able to do without any previous website building experience. Version 12.2 of the website builder adds many new features and improvements to BlueVoda, ranging from whole new features to further options and even just small bug fixes. BlueVoda 12.2 also includes features designed to make your website more W3C compliant to be sure that your website displays correctly across all the major web browsers. New feature: Add ‘Remove PHP code during preview’ option, to be able to preview PHP pages locally. New feature: Add ‘Disable IE security warning during preview’ to preview options. New feature: Automatic backup option. Makes a backup copy of projects every 5, 15, or 30 minutes. New feature: Add option to (automatically) make a backup of the project on the server. New feature: Implement proportional resizing for all objects: Hold down SHIFT + Bottom-Right handle while resizing. New feature: Add ‘Paste in Place’ in the main and context menu. New feature: Add ‘Enable HTML encoding’ in HTML options. This will save the document with the selected codepage/charset. Unicode improvement. New feature: Add the ability to center a popup window in linksNew feature: Add ‘Don’t publish’ option to objects. This allows you to exclude an object’s assets from being published.